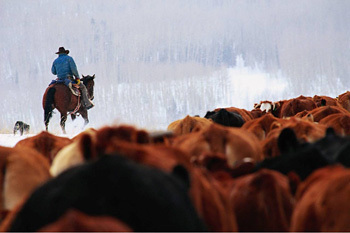 Our Job as Copywriters and Marketers – Driving the Herd! Who else wants a stampede of customers, a cavalcade of profit? Who else is tired of the “who else wants” headline that was so popular at one time with internet marketing and how to make money products? Why do you think some copywriters continue to kick its tires and take it for a spin? Because at one time, it tapped into the herd mind and it worked. Obviously we’re talking about definition 2a here. It’s every business owner, marketer, and copywriters dream to crank out copy and ads that lead the herd in their direction. The more intelligent among us aims for a long term relationship, not a slaughter – we’d like as many repeat customers as possible! What creates a herd? People strive for independence; people have given their lives for independence, so knowing this, what makes us act like a herd? To understand the herd mind, we need to go back in time to caveman days. When life comes at us too fast, our brain attempts to make the best decisions on a limited subset of data points. For example, picture a group of cavemen upon hearing a tiger growling in the bushes. Now it’s possible that a few of those cave persons had never seen a tiger eat a fellow caveman, but most probably had. For our example, let’s say that two cavemen had never seen a tiger kill and eat person. Those that had witnessed such an event in the past, immediately take off in the opposite direction of the sound of the tiger. One of the two who’d never seen a tiger sticks with the “herd” of cavemen and gets the heck out of where Dodge will be in several thousand years! The other caveman walks around trying to get a better understanding of exactly where the sound is coming from and wonders if it’s possible to kill whatever’s making it with a rock… He probably did not succeed in killing the tiger, the tiger probably succeeded in eating him for a nice midday snack. The tiger virgin that ran with the group lived on to pass his “herd mind” on to a few cave babies. Thus, is the beginning of our brains choosing to follow group action when we don’t have time to process all the information presented to us, or don’t understand the situation at hand. This second reason, not understanding the situation at hand, is very important to grasp. People will act with the group rather than risk being different, especially when they don’t understand or have any comprehension of what’s going on. It’s why a single, lone bystander will probably assist someone who’s hurt or in some dangerous situation, but when a group of bystanders is at hand (vs just 1 person) sometimes no one ever offers help. The larger the group, the more likely no one will assist – each assuming that someone else already has, or that everyone knows something that they do not about the situation. Most of us don’t have to worry about tigers eating us these days (although there was a chimpanzee attack this past week), yet the genetic predisposition to follow the herd is just as strong as ever. On the down side, among other things, it leads people to lose their life savings, commit mass suicide, and elect questionable politicians without asking any questions. On the plus side, it still protects us when we need it a majority of the time. We can’t possibly deal with all the inputs we receive as we navigate life each day. Modern life just keeps getting faster and faster so the ability to suspend the need to analyze each and every situation and “go with the flow” is just as important and just as great an advantage today as it was to our caveman ancestors. If we didn’t have it, we’d be crippled, frozen in place like a deer in headlights. So that’s why headlines like the over used “who else wants” work: it makes the reader feel left behind by everyone else, like they don’t know, or have, something that everyone else does: and so the herd mind kicks in and makes the reader read the rest of the ad. This power of the herding force is usually stronger among similar groups of individuals than among randomly mixed groups of people. For example, people with a common ethnic heritage, or a common goal, or a common whatever that makes them feel connected with each other. If the person trying to lead the herd shares that same connection they’ll be much more successful in getting the others to follow. This partly explains those hot Christmas presents every year – the ones that moms are fighting over, or paying hundreds of dollars over retail for on eBay. They just have to get it for their child because… well, because everyone else is trying to and they don’t want their little darling left out. But those savvy marketers also know that by limiting supply, a lot of moms and dads will not be able to get the “hot” item and purchase other gifts, all the while promising little Sally or Johnny that as soon as the stores have the “hot” item again they’ll go back and get it for them. And guess what – after Christmas the stores magically get more shipments and a lot of parents go back and buy that “hot” item (after already buying other presents for their kids – so they’ve been “herded” into buying more than they otherwise would have). Our job as a marketer or copywriter is to identify the fears, goals, dreams, and aspirations of our prospects and use that information in our headlines and copy to stir people to take action. Testimonials show the prospect that his or her peers are running from the tiger to safety, and subconsciously urge them to follow. People will unquestionably believe and follow an authority figure such as a doctor, but a lot of products or services don’t lend themselves to that type of figurehead. Conversely, if we perceive that we’re being sold by a salesman we won’t follow. But the next best thing to an authority figure is someone like us, a regular Joe saying it worked for me, I’m cured, I’m happy, or whatever the product or service promises. We’ll believe those like us, testimonials are word of mouth type proof that we will follow. So the next time you sit down to work on your copy, put on your cowboy hat and start driving the herd! One Thousand New Accounts Added Each Day! Don’t be Subtle – Wallflowers Don’t Dance!